While defending his "stimulus package" during his first presidential press conference, President Obama said, "I think my initial measure of success is creating or saving 4 million jobs." Although it was the third time during the appearance that he had stated this as his goal, none of the reporters bothered to ask the obvious question of how he would know when he'd saved a job. Since liberal politicians always take credit for jobs created in the private sector, Obama will be understood to have "created" 4 million jobs, just as long as the employment figures increase by at least that many. If the economy adds only 3 million jobs, however, he can simply claim that it would have lost a million if not for his intervention, hence a total of 4 million "created and saved" jobs. Even if the employment numbers continue to decline, all he has to do is to say that they would have fallen by 4 million more, and, presto, he'll have "saved" 4 million jobs. If you're employed, you might even count your own job among those that he has "saved," as many undoubtedly will. It can't be long before hyperventilating sycophants start thanking the president for saving their jobs at town-hall meetings. Even Julio from Fort Myers, Florida, will express his gratitude to still be screwing up drive-through orders at McDonalds. 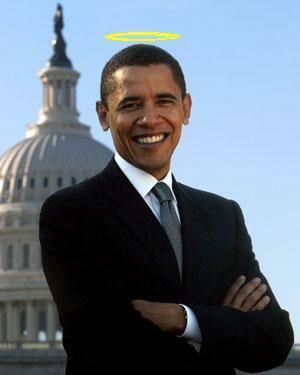 To someone who enjoys the degree of media support that Obama has, becoming a savior is just that easy. If he can get away with claiming accomplishments based on a lack of proof to the contrary, then the sky's the limit. Just ask any toffee-nosed ninny who pretends to be "saving the planet" by carrying a cloth grocery bag. The planet's still here, isn't it? Well, then. In that same vein, Obama, who heralded his nomination as "the moment when the rise of the oceans began to slow and our planet began to heal," can claim on a daily basis to have prevented the sun from exploding. If he's ever proven wrong, who will be left to point it out? Furthermore, he can take credit for preventing natural disasters, because the number and the severity of them could always have been greater. If there are 20 hurricanes next year, and he says there would have been 25 if not for his "green" initiatives, who will dispute it? Not the Washington press corps, if their behavior to this point is any indication. If the president wants to be thought of as a health care reformer, a key component of his plan will be preventative medicine. Just think how many scores of millions of people he can spare from the ravages of such ailments as smallpox, leprosy and scurvy, simply by announcing his intention to do so. Preventing occurrences in this manner is easier the less common they are in the first place. If, for example, Obama declared that he would save people from being eaten alive by koalas, his success rate would be astronomical. Unfortunately, his constituents would be unlikely to appreciate this feat, since they've never heard of such a thing happening. It's more advantageous for him to say he'll reduce the frequency of experiences, like losing a job, with which most people are familiar. The question is, why only 4 million jobs, when many times more could be "saved" just as easily. According to one recent estimate, by Speaker of the House Nancy Pelosi, America stood to lose 500 million jobs if the stimulus bill hadn't been passed. If Obama were a true visionary, he would "save" all 500 million of them. Sure, it's mathematically impossible, but that only matters to people who are willing to hold him accountable for what he says. Seldom if ever do the media question socialist success stories, however preposterous they may be. For example, Fidel Castro routinely gets away with saying that Cuba has a 100 percent literacy rate. If he also said that he'd saved more Cuban jobs than there are Cuban people, we would no doubt see that just as credulously repeated in American newspapers. If there's anyone who gets better press than Castro, it's Barack "spread the wealth" Obama. To question the veracity of his goals and achievements would be to question their underlying socialist assumptions, which the media are evidently disinclined to do. Perhaps that's because, as willing as they are to let their favored politicians take credit, reporters understand that when it comes to saving their jobs, they're on their own.